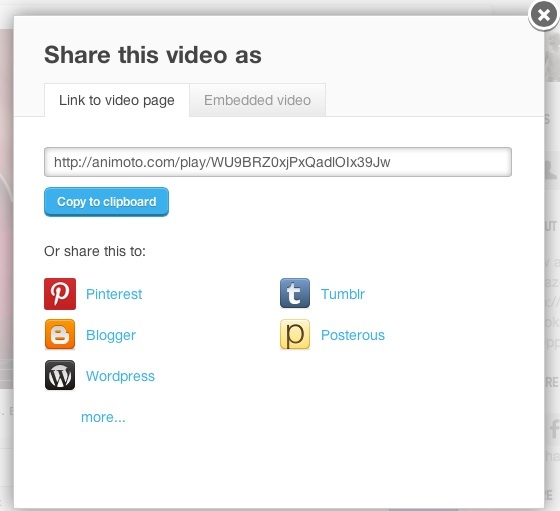 Sign up with Animoto.com (it’s free, and you can use your Facebook log-in if you have one) then click on the blue ‘Create video’ tab on the top/right-hand side. Pick a theme you like (click on them to play the examples). There are 30 free ones and 8 Pro (which means paying £5 (I’m in the UK so I guess c.$8?) a month to create as many trailers (30-second and longer) as you like… tempting if you plan to create them regularly. 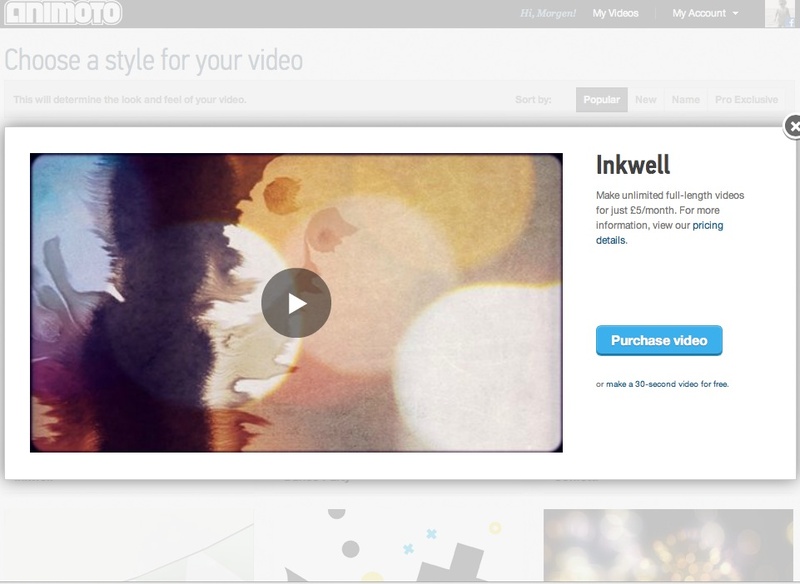 When you click on the style (theme) you want you’ll see a blue tab marked ‘Purchase video’. This means signing up to Pro but underneath (in much smaller lettering) is ‘or make a 30-second video for free’. Once you take the option you want, it’ll take you through to the main put-it-all-together screen. The ‘change style’ box (top/left) is already ticked green but you can change your mind. 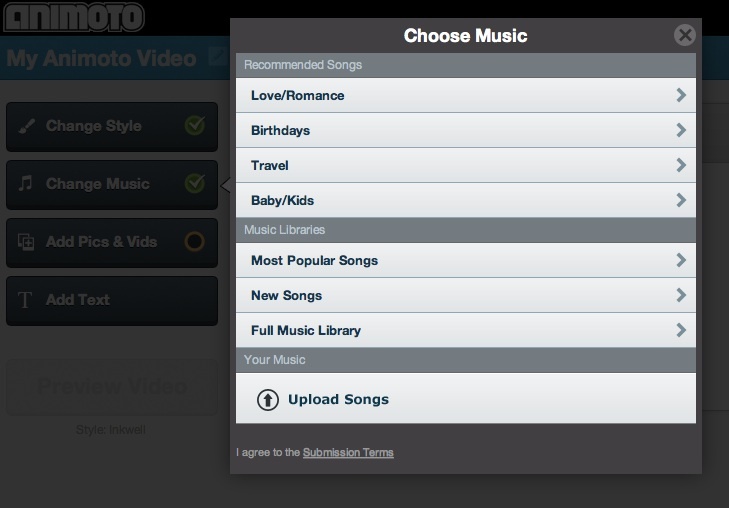 The next box is ‘choose music’ and when you click on that it takes you through to a variety of music menus. Unless one of those menus suits you (e.g. Love/Romance, Birthdays, Travel, Babys/Kids), I’d recommend going with ‘Full Music Library’, or you can select ‘Most Popular Songs’ or ‘New Songs’ but then you won’t know what you’re missing. You can listen to any of the pieces by clicking on the play button to the left of the song name (which appears when you hover over them). Once you’ve chosen (clicked on) the one you want, click the blue ‘Add Song’ (bottom/right). Spotlight: if you select a photo and click on ‘spotlight’ it will keep it on the screen for longer. Rotate: as the name suggests, it rotates the photo 90 degrees each time you click it. Duplicate: simply replicates what you have highlighted, i.e. another photo (spotlighted if the first is spotlighted) or text. Shuffle: If you highlight more than one image or text (you do this by holding down your shift button and clicking on the ones you want, to deselect click it again) then it will use them in a random order. Delete: again does what it says on the tin. Highlight the picture or text box you want to remove and click the delete option and it’ll ask you if you’re sure. If you are, click on OK.
Shuffle only activates if you highlight two or more text boxes and / or photos. You cannot spotlight or rotate text so these options are not ‘live’. NB. If you’re doing a book trailer (or suchlike) remember to put your website / contact details at the end! NB. Because the trailer (if choosing the free option) is only 30 seconds long you don’t want too much content or the slides won’t stay up for very long, another reason to keep them simple (although not so simple that there’s nothing much to see). You’ll see what I mean by clicking either of my two above. 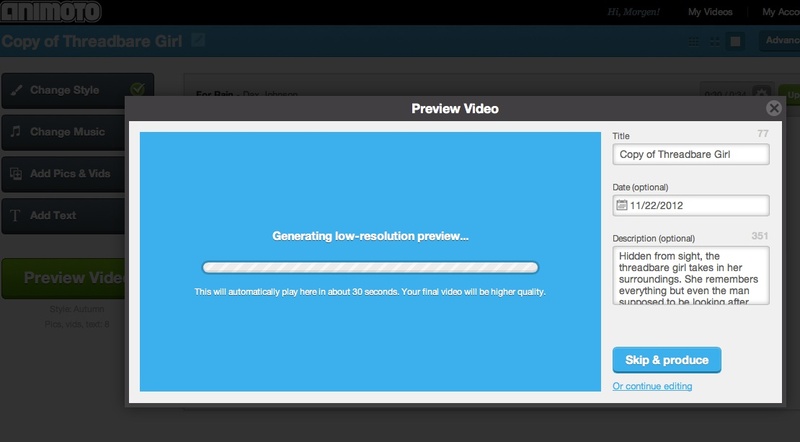 Once you’re ready click ‘Preview video’ and it’ll play it. There’s also space for a title and description. I’d recommend adding both. If you’re happy with it* click on ‘Produce’ (or ‘Skip and produce’ if you’ve played it already previously) and it’ll chug until it’s ready (only a few seconds). If there are changes to be made before you publish it, click on ‘Or continue editing’ (underneath the ‘Produce’ / ‘Skip and produce’ option). You can also click on ‘Save’ (top/right) and come back to it later. The ‘Advanced Settings’ option (top/right) is where you put the video title, the producer is your name (you can change this), the date will be current unless you select another option, and then any description you want. 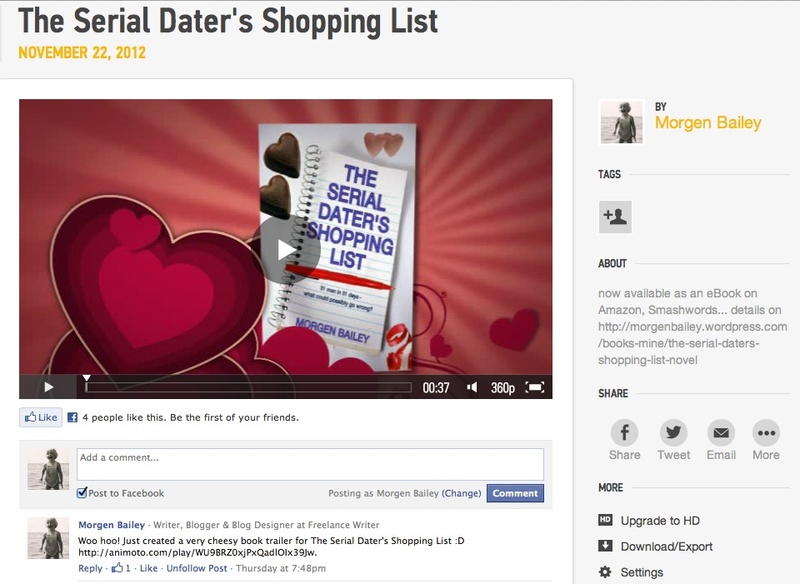 This description will appear below your video on YouTube so an opportunity to say what it is (e.g. your book info.) and where your book can be bought from). Once a video is published you can’t make changes to it. 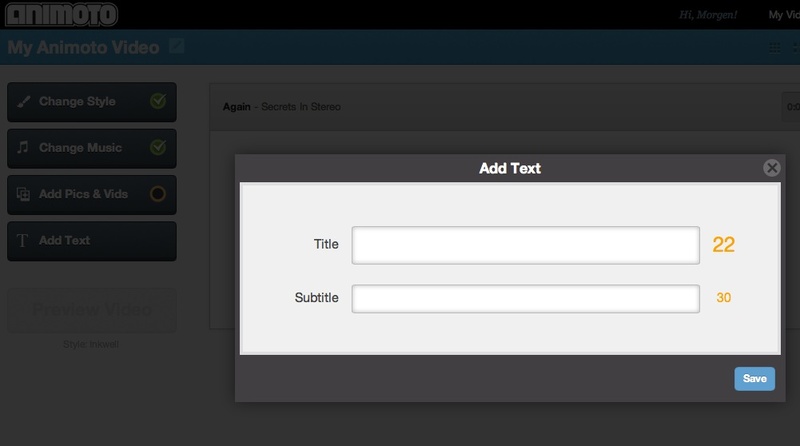 If you want to edit it you go into it (via the ‘My Videos’ option (top/right) then choose ‘Edit a copy’. You’ll then get given a different website link to it so don’t go sharing it until you’re really sure it’s the final version. Once you’ve edited the copy and published then you’ll then need to delete the original (see below). If you want to delete a video once it’s been published, click on ‘My Videos’ (they display in creation order with the newest on the left) and click on the relevant video thumbnail picture then the little ‘settings’ wheel on the bottom right-hand corner of that thumbnail and hit the ‘trash’ icon then ‘delete forever’. If you have a YouTube or SmugMug account you can ‘export’ it to YouTube by going into the video (from ‘My Videos’ then click on the relevant video thumbnail picture. Then click on the ‘Download/export’ button (bottom/right) and click on the YouTube or SmugMug option and Animoto will email you when it’s ready. So, there you have it. If you have any queries, just let me know and see what I can do about making the above clearer. Or… leave a comment below with your comments / video link! This is fantastic information–much clearer instructions than I found on the animoto site. Thanks! As usual this post on your blog is informative and very interesting. 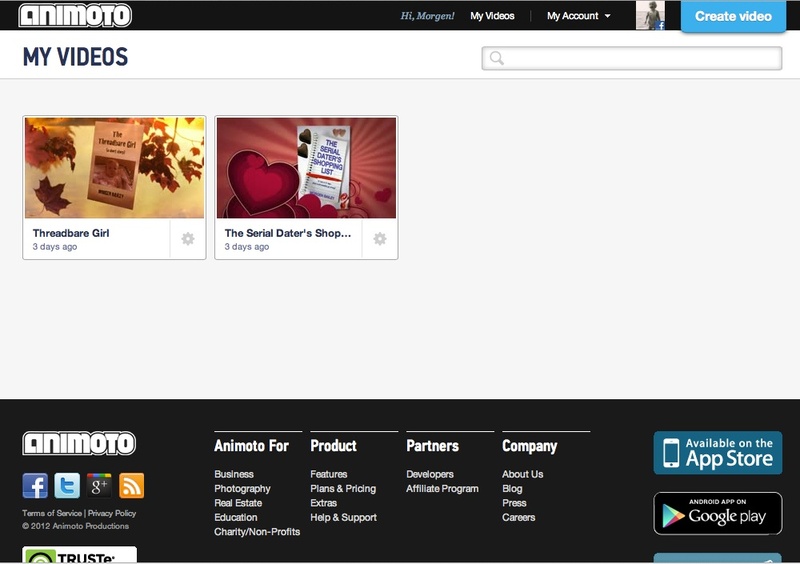 The step by step explanation of how to use the animoto site looks easy to follow. I’d like to create a book trailer for Foxden Acres, and this looks just the job. Thanks Morgen . You’re very welcome, Jane. Book trailers are an unknown quantity re. sales but like everything else (Twitter, Facebook, etc.) I think they can only help. Great post. Lots of useful advice and guidance Thanks. You’re very welcome, Lindsay. I hope it makes sense when you come to have a go. Aren’t they great. 🙂 I like the simplicity of yours. Too much to read can overwhelm. Having saved this post in favourites, I thought I’d read it again. 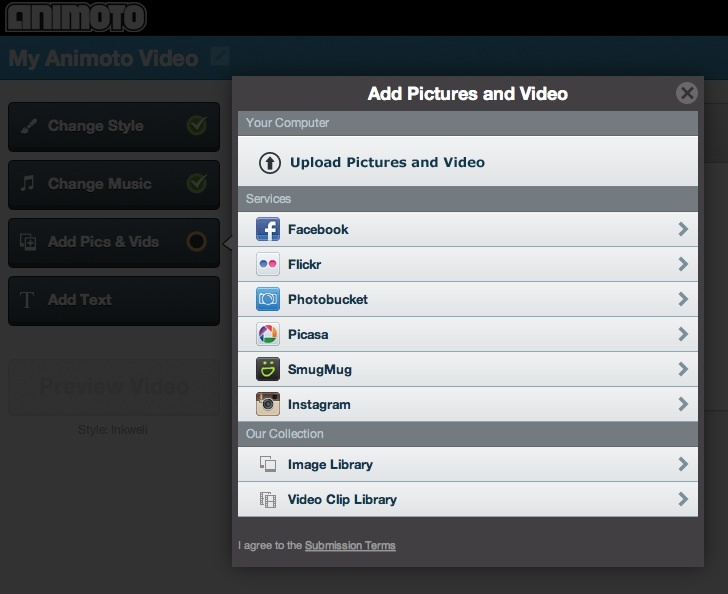 I love the two 30 second trailers you created Morgen, and will definitely download Animoto.com and give it a try. Marketing can never be too late. You never know when someone will stumble upon something you’ve done. Thank you for stopping by (again), Madalyn. Thanks, Heather. 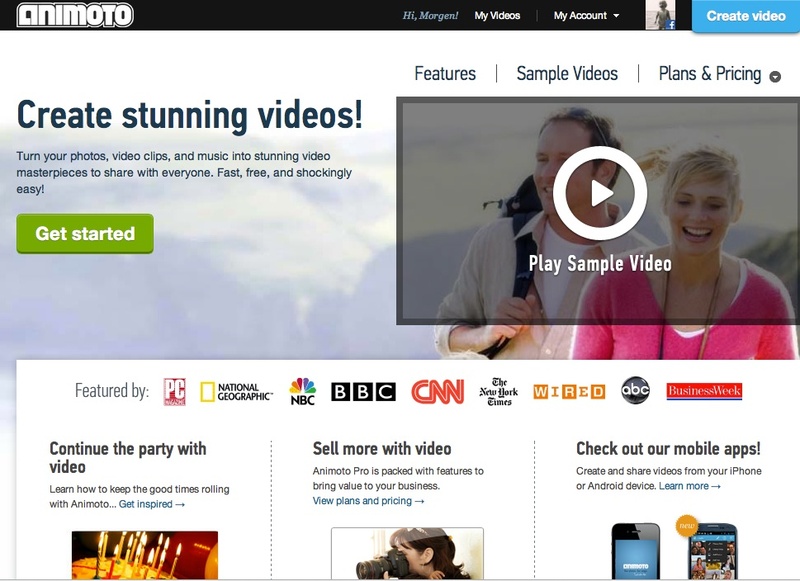 Animoto’s great, isn’t it and you can do so much for free. Wow, do you mean to say that the music and images they provide are free for you to use, even with the free version? That is HUGE! I have started to create videos using other methods soooo many times but have always been scared off by copyright infringement issues, especially where music is concerned. I can come up with my own images, but music? Not so much. I will definitely be checking this out! I do. 🙂 Let me know how you get on. The freebies are only 30 seconds long (probably enough for most people) but by paying £30 (c.$50) a year you can have videos for up to 10 minutes (and you can download them to your computer or burn them on to DVD), which in the scheme of things is very reasonable, given you can make as many as you like. This is one thing that really hung me up! Patrean, Pubslush, and other Kickstarter-like programs for writers usually want you to make a trailer for your book. “I’m a writer, not a filmmaker!” I said, but now it looks fairly easy! Thanks for the info – I will give it a try! Thank you, TCC. I hope it goes well. I’ve added your blog to https://morgenbailey.wordpress.com/links/other-writing-related-wordpress-blogs. That takes the mystery out of it. Thanks, Morgen. 30 minutes seems enough. A ten-minute trailer for a book, daunting. 🙂 You’re welcome, Michael. Do let me know how you get on.